In this exercise, we'll use observation to draw the Universe as it might have been seen by neolithic peoples. The drawing will end up being identical to Stonehenge. You will need to be at the same latitude as Southern England for this to work. If you're not at a latitude of 51º, you will end up with a slightly different result. a) Preferably done near either near the summer or winter solstice. 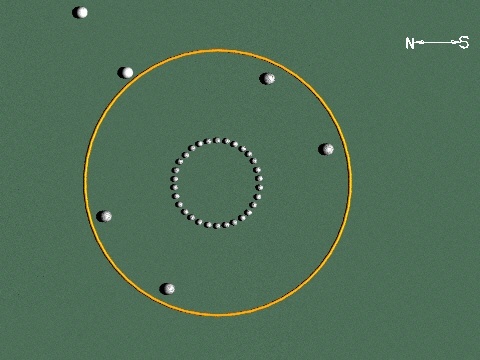 From the earlier experiment, the students will have noticed that the Heavens will revolve around them. We are going to draw that world exactly as the students would see it, and the students will see themselves as standing at the top of a circle (representing the World). 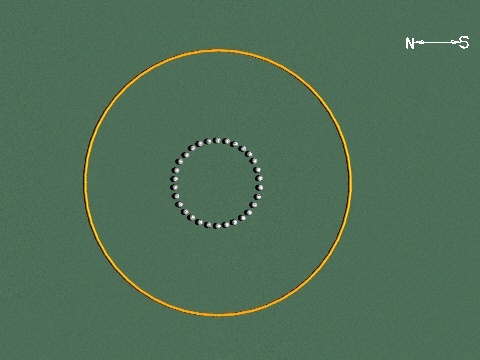 a) Draw a circle to represent the world using a ring of stones (30 is good number for this). 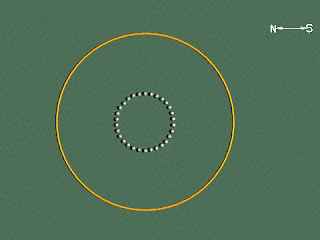 Use the string to set it out from a post or marker in the centre). 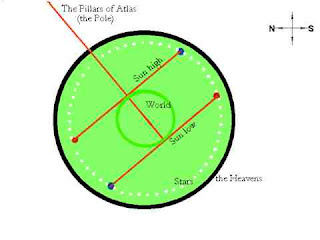 In the experiments, we will be looking from the east so that we can draw the celestial polar axis as we see it. East will represent the top of our drawing. 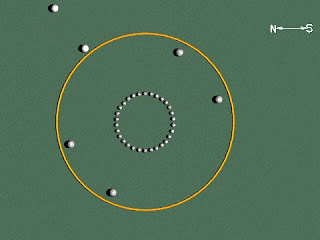 b) Draw another circle, 3 times bigger, around the first to represent the sky. This could be a large hula hoop or similar. You can't draw the Earth and Sun to scale so we're not going to try. 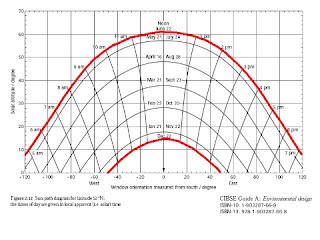 In summer, you will see the sun (at midday) at an angle of about 63° above the horizon. In winter, you will see the sun (at midday) at an angle of about 15° above the horizon. 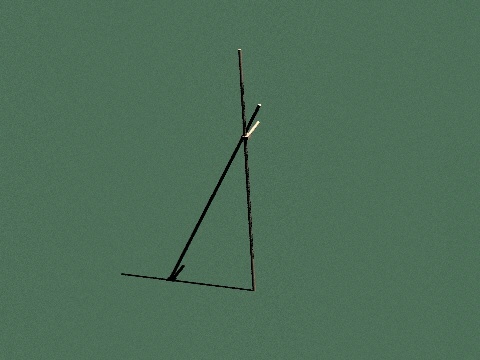 Take the clamped sticks (summer is shown) and place them on the ground so that the vertical stick is up (east-west) and the other post is at the centre of the circle: The Earth would be a tiny dot at the centre of the circle if it was to scale. 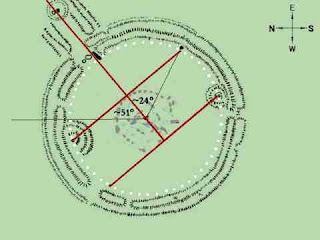 The drawing of the celestial axis, a line projected from Earth to the pole star, matches the alignment of Stonehenge's Avenue. 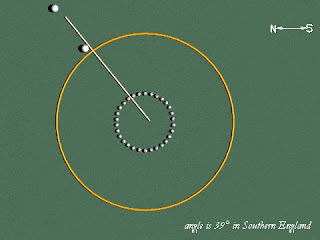 The drawing of the summer solstice solar plane is in the same alignment as two Station Stones at Stonehenge (94 and 91). 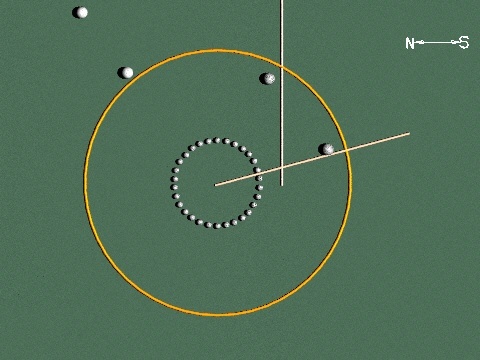 The drawing of the sun's position within the solar plane at midnight on summer solstice corresponds with the position of Stonehenge's Station Stone 94. The drawing of the sun's position within the solar plane at midday on summer solstice corresponds with the position of Stonehenge's Station Stone 91. 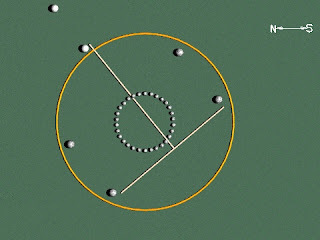 The drawing of the winter solstice solar plane is in the same alignment as two other remaining Station Stones at Stonehenge (93 and 92). 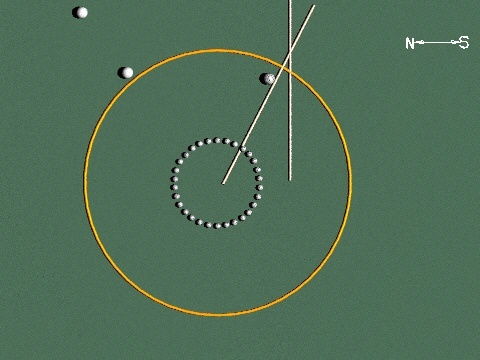 The drawing of the sun's position within the solar plane at midnight on winter solstice corresponds with the position of Stonehenge's Station Stone 93. The drawing of the sun's position within the solar plane at midday on winter solstice corresponds with the position of Stonehenge's Station Stone 92. 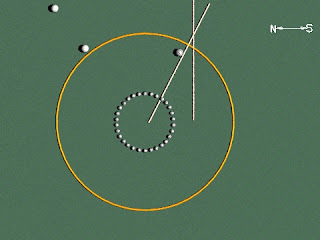 Of the Station Stones at Stonehenge, some specific apparent solar events appear to be represented by mounds and ditches surrounding the Station Stones. A raised circular inwardly facing bank, just beyond the Aubrey circle, exists at Stonehenge in the correct location to correspond to a celestial sphere. 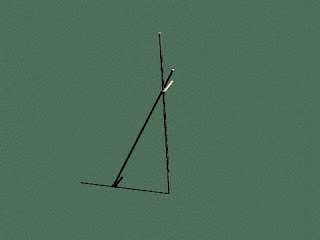 'He had told the youngers that these [two] sticks could show them the nature of the universe.' from The Broken Stone and the secret of the Heavens' Henge. The celestial polar axis will be a line, 39° anticlockwise, drawn from the North Pole to the North Star. The equatorial line will be 51° clockwise from where you are standing. 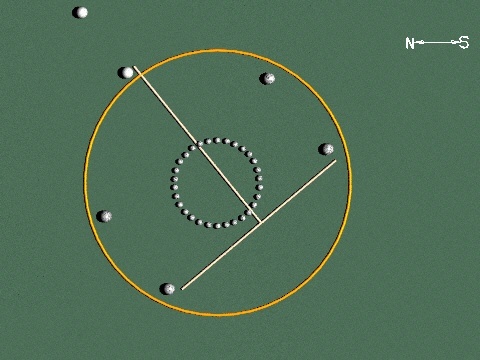 Lines representing solar planes could be drawn at an angle of 51° clockwise. 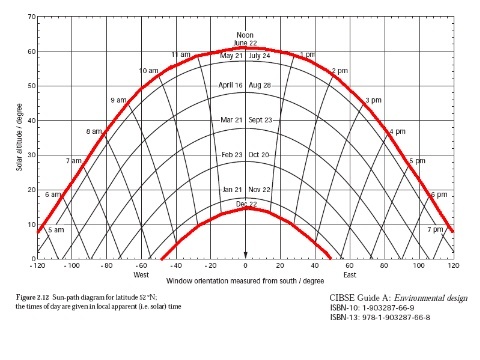 In summer, you will see the sun (at midday) above the horizon at an angle of about 63° (39° + 24°) above the horizon. To draw the summer sun's position at midday, put a point at 27° (90°-63°) clockwise from vertical on a line from the centre of your drawing of the World. The same thing can be done for midnight winter and midnight summer sun positions using a similar method. New: Link to: Part 3 of make your own Heavens' Hinge.